In setting up your router with your Internet Service Provider's (ISP) modem, one of the challenges you may encounter is when there is no WAN or Internet IP Address registered in the web-based setup page of your router. This is a known issue for Cable modems that are not immediately recognized by the router. To resolve this issue, you may need to manually configure your router to communicate better with your modem. For instructions, click on the links below. QUICK TIP: The WAN IP Address is provided by your ISP and can be located in the Status tab of the web-based setup page. 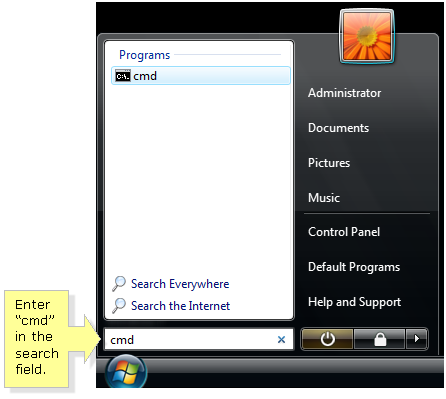 Click the Pearl button and enter “cmd” in the search field. Then, press [Enter]. In the Command Prompt window, enter “ipconfig/all” and press [Enter]. Locate the Ethernet adapter Local Area Connection section and take note of the Physical Address. This is what you will use on the router’s web-based setup page. NOTE: The Physical Address is also called the MAC Address. Connect your computer and modem to the Linksys router. For instructions, click here. 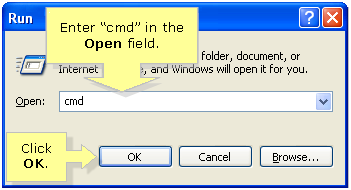 Enter “cmd” in the Open field. Then, click OK.
Unplug your ISP’s modem from the power outlet. NOTE: To learn how to access the router’s web-based setup page using a Mac® computer, click here. 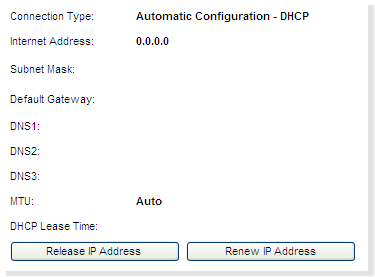 On the Setup page, click the MAC Address Clone sub-tab. Click Enabled and manually enter the MAC Address in the available boxes. 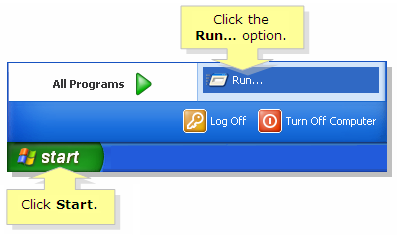 IMPORTANT: Do not click the Clone My PC’s MAC button. 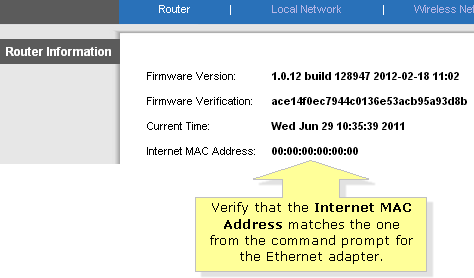 IMPORTANT: Verify that the Internet MAC Address matches the one from the command prompt for the Ethernet adapter. When you are sure that the MAC Address is a definite match, power OFF the router by unplugging it from the power outlet. Plug the modem back to the power outlet and wait for all the lights to sync up including the upstream and downstream lights. Power back ON the router and wait for the lights to sync up. Access the router’s web-based setup page and click the Status tab to verify your ISP’s Internet IP Address. The Internet IP Address from your modem will now reflect on the router’s Status page. You may now test websites to verify your connection to the Internet. IMPORTANT: If you can’t access a website and there is no Internet IP Address on the Status page of the router yet, click the Release IP Address and Renew IP Address button.